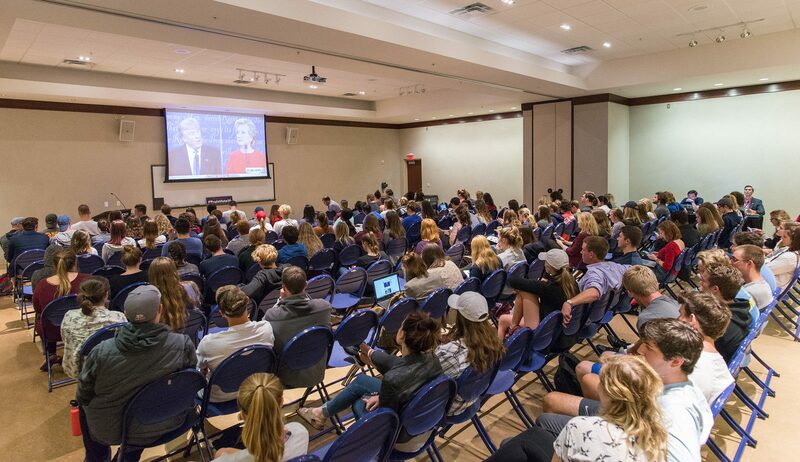 As the candidates faced off in the first presidential debate of the fall campaign season, Belmont students gathered in the Beaman Student Life Center to watch the evening unfold as part of the University’s ongoing #BruinVote16 programming. A student-led initiative designed to encourage fellow students to educate themselves on the issues and make their voices heard through their vote on November 8, BruinVote16 is tied to #CollegeDebate16, a national, non-partisan initiative to empower young voters to identify issues and engage peers in the presidential election process. SGA President Chris Dickerson kicked off the evening and was joined by Silas Deane and Jacob Sykes, presidents of Belmont College Democrats and College Republicans respectively, who all encouraged civil discourse among those in attendance. While the crowd audibly reacted at numerous points throughout the evening, the participants modeled respect for alternate opinions. Following the debate, Tennessean Opinion Engagement Editor David Plazas led an open and engaging 30-minute conversation among the more than 100 students on site to gauge students’ reactions to the debate itself while also analyzing campaign issues that are important to millennials. NewsChannel5 and The Tennessean both were live on campus covering the event.